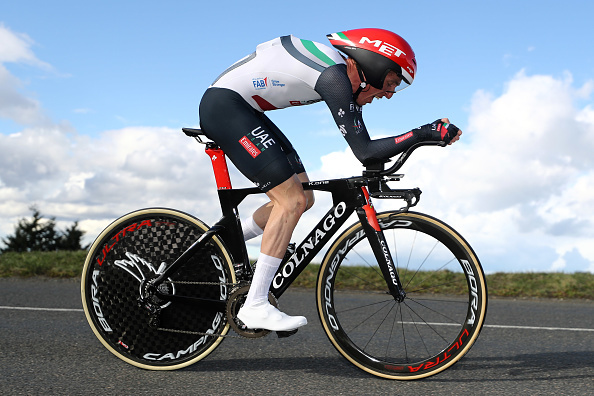 Irish climber Dan Martin will be happy with his time in the opening TT stage in Spain. He has kept himself nicely in the hunt for outright victory in gaining time on most of the field. Ireland’s Dan Martin has taken his first result of the season, finishing just inside the top 10 on the opening stage of the Volta a La Comunitat Valenciana. The Irish climber coped really well with the climb to the finish line at the end of the 10.3km TT in Orihuela. The stage was won by Norwegian Edvald Boasson Hagen (Dimension Data) in a time of 12:55. He was five seconds faster than Ion Izagirre (Astana), with Tony Martin (Jumbo Visma) in third another two seconds back. Dan Martin (UAE Team Emirates) finished in 10th place, some 20 seconds down on the stage winner and first overall leader of the race. World road race champion Alejandro Valverde (Movistar) was ahead of Martin; in 8th place and six seconds faster. Tour de France champion Geraint Thomas (Team Sky) is getting his season underway at the event in Spain and he was 13th today. Thomas was 21 seconds off the pace and finished less than a second slower than new WorldTour pro Harry Tanfield (24). Tanfield won a Tour de Yorkshire stage last year with Canyon Eisberg and now rides for Katusha Alpecin. The Volta a La Comunitat Valenciana continues until Sunday. While there are some climbs tomorrow, Dan Martin will have a better chance of a stage win on Friday and Saturday. Both stages are hilly and feature uphill finishes; Saturday’s finish the hardest with a steep 4.2km incline to the chequered flag. Dan Martin rode the race last year and was 5th in the final standings. He also competed in 2016 when he won the second stage. The 32-year-old, who is now in his second year with UAE Team Emirates, got his season started last week at Challenge Mallorca. He was 13th in Trofeo Andratx-Lloseta (1.1) and was a non-finisher in Trofeo de Tramuntana (1.1).